For 65 years, the Jordan Fall Festival in Jordan, New York has flourished with a mix of old time charm, good food, family atmosphere and traditional competitions. Each year, people look forward to the Kid’s Greased Pole Cross. Picture two slanted poles next to each other with bells at the top. Both thickly covered in grease (aka Crisco shortening). Got it? Well, let me help you out with the visualization. 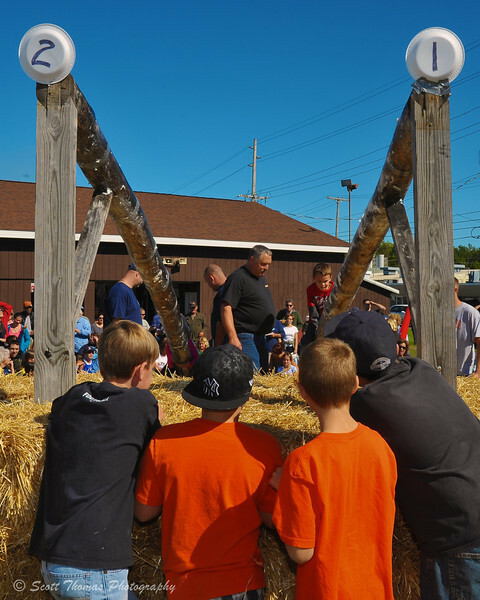 Contestants wait for their turn at the Kid's Greased Pole Cross at the Jordan Fall Festival in Jordan, New York. Nikon D700/24-85G, 1/160s, f/16, ISO 200, EV 0, 30mm focal length, fill flash. Kid’s aged 5 to 13 compete in four different groups to see which ones can reach the top and ring the bell the fastest. Everyone gets two minutes and, if one does not reach the top, their distance up the pole is recorded. Starting positions for each group is determined by draw. The later the position one draws, the more grease will have been removed by the other kid’s clothing. Moms must love this competition! 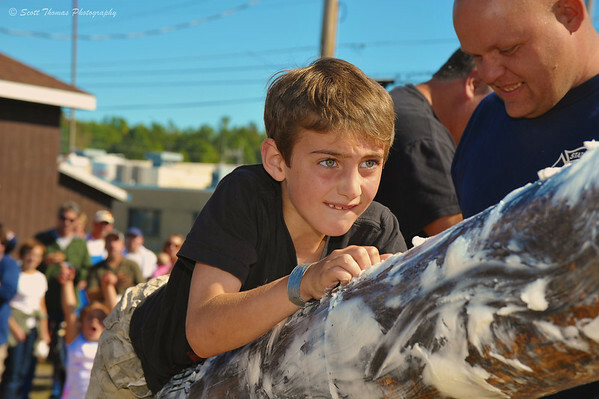 As friends and family cheer him on, a boy tries his best to inch his way up the greased pole at the Jordan Fall Festival in Jordan, New York. Nikon D700/24-85G, 1/250s, f/10, ISO 200, EV 0, 85mm focal length, fill flash. 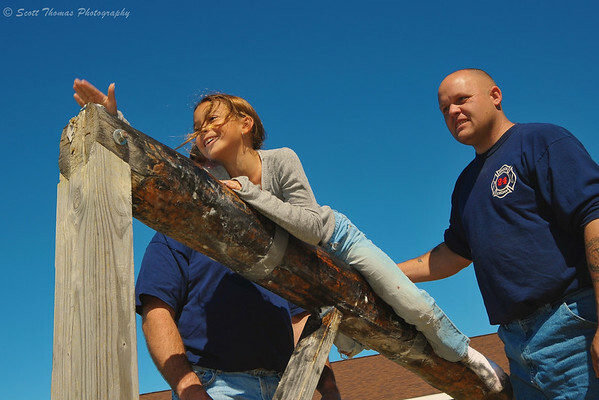 As her time runs out, a young girl reaches as far up the greased pole as she can at the Jordan Fall Festival in Jordan, New York. Nikon D700/24-85G, 1/160s, f/16, ISO 200, EV 0, 78mm focal length, fill flash. 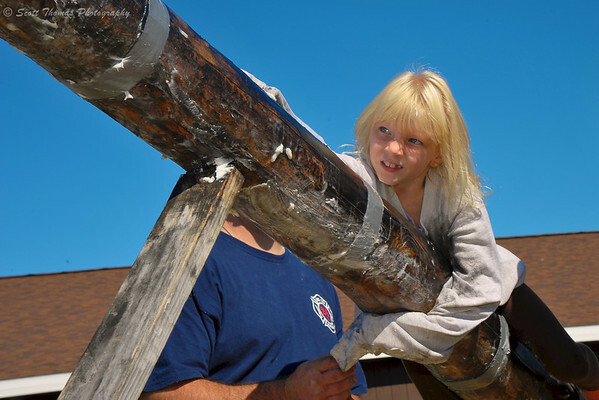 A girl smiles triumphantly as she rings the bell during the Kid's Greased Pole Cross competition at the Jordan Fall Festival in Jordan, New York. Nikon D700/24-85G, 1/250s, f/13, ISO 200, EV 0, 30mm focal length, fill flash. I give this boy points for his perseverance and creativity. 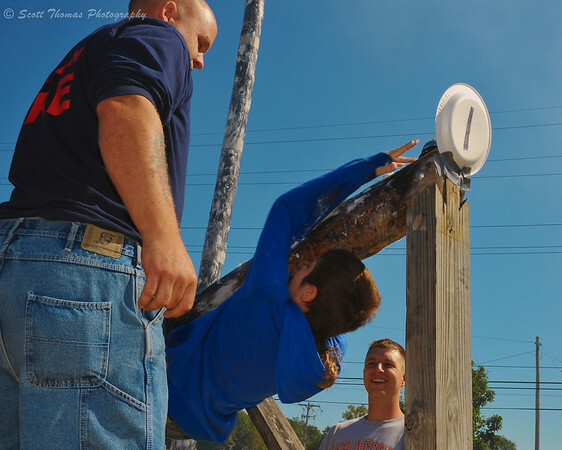 A boy hangs on as he reaches up to ring the bell during the Kid's Greased Pole Cross at the Jordan Fall Festival in Jordan, New York. Nikon D700/24-85G, 1/160s, f/16, ISO 200, EV 0, 35mm focal length, fill flash. This is my submission for Assignment 15: Competition. This entry was posted in Assignments, People and tagged 24-85mm, autumn, blue sky, boys, competition, crisco, cross, fall festival, fun, girls, greased pole, jordan, kids, new york, nikon D700, shortening. Bookmark the permalink. LOL I’ve never even heard of a greased pole cross competition! I don’t think I would have anything to worry about with my girls, although Sara just MIGHT want to do this! I bet she would. This event is very popular. There were about 200 people watching this event and twenty-four contestants did their best to reach the top. I think about half did. Do they let the girls compete against the boys? Great shots. Looks like a lot of fun! The kids and spectators had a good time. I wonder who first thought up such a competition. Maybe Crisco or Fluffo shortening 😉 Very slick. What fun it seems to be ! I love the various kids’ expressions you captured, they are all very persistent. This is great. That’s the best part of this competition is the kid’s faces. Most people sit behind the poles and do not see them. Now there’s a competition I never would have expected to see! I figured you had something good in mind when you decided competition would be one of your photo assignments! They are all very good photos, and also informative which is good, too, for such a kind of competition has not yet reached my little country…very creative idea, – do you have any examples of where the skills can be used? Well, in today’s world, probably not much use for a skill to shimmy up a grease pole. Maybe years ago is was a skill that would come in handy on a family farm. This has got to be the most creative competition I’ve ever seen (and I’ve never seen anything like it!). Fantastic shots. Sorry I didn’t participate this time around, Scott. I took a bunch of photos of a “Wearing of the Kilt” contest (the family version — no raising of the kilts) where they judge knobby knees, hairy legs, best strut, etc. None of the photos came out well. Rats, Robin, that sounds like another creative contest! Did you use a flash? In all of these photos I used fill flash to fill in the shadows from the very bright sunlight. That really helped.